It's always entertaining to cyberstalk yourself, and today's dreary weather seems a good reason for it. Here's an article written by the Anchorage Daily News on August 3, 2008, that was later picked up by Alaska.com. It's the first time I was ever quoted in a newspaper... A big day for both Maxie and me! SOUTH ANCHORAGE: They make up more than half the collection here. He slowly pokes his nose from underneath a tan blanket, revealing three inches of thick black eyeliner. 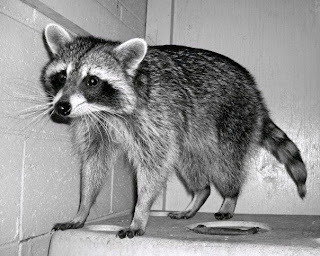 After Max, the 1-year-old raccoon, jumps down from his wooden hideout, you can see his bushy black and tan striped tail. “He’s still really shy,” said Lisa Chickos, an Alaska Zoo keeper. Max was illegally brought up from Texas as a pet and was spotted in Soldotna, walking down the street alone, wearing a dog harness. He was living in someone’s garage, Chickos said. He and other orphaned or injured animals make up more than half the collection at the Alaska Zoo in South Anchorage. With three-fourths of zoo visitors coming during the summer months, Max and his deserted or disabled friends are getting a lot of attention these days. All the orphaned or injured animals except the polar bears are land mammals or birds, and most — like moose, brown and black bears and bald eagles — are native to Alaska. This is all atypical, say Outside zoo leaders. It’s unusual for zoos to have such a large portion of the viewing collection made up of orphaned or injured animals, said Steve Feldman, spokesman for the Association of Zoos and Aquariums, headquartered in Maryland. Most zoos have rehabilitation programs for certain species, with the hope of releasing them back into the wild, he said. And unlike the case at the Alaska Zoo, many of the animals that zoos take in are marine mammals, like manatees, sea turtles, dolphins and whales. The Alaska Zoo also stands out internationally. “In Africa, a number of zoos have been converted into ‘sanctuaries,’ caring primarily for orphaned primates and other wildlife, but as a general rule the number of such animals comes up only for a small percentage of the collection of a zoo,” said Peter Dollinger, executive director of the World Association of Zoos and Aquariums, in an e-mail from Switzerland. So what’s up with the Alaska Zoo? It’s cared for injured or orphaned animals since opening 40 years ago, Lampi said. Once the state Department of Fish and Game finds an orphaned or injured animal and a place for it to go — often a zoo Outside — the Alaska Zoo serves as a temporary holding facility. Alaska Zoo keepers provide the animal with a home and administer any necessary testing or vaccinations before the recipient zoo takes it in, Lampi said. But they require a destination before agreeing to do that. It would be unethical to knowingly take in for a few months “cute and cuddly” orphans that couldn’t permanently stay at the Alaska Zoo or another zoo, Lampi said. In rare cases, orphaned bear cubs or moose calves have to be killed when wildlife officials know that no one wants them. On July 4, an Alaska wildlife trooper killed a black bear in East Anchorage because it refused to be shooed away. Afterwards, two cubs were discovered hiding nearby. No one wanted the cubs, so they were also killed. Killing cubs is a last resort and generally done only when the mother bear is also killed, said Rick Sinnott, area biologist for the state Department of Fish and Game. Many zoos don’t need black bears from Alaska because they are common in most U.S. states, can live up to 20 years and only two or three can live together in a zoo exhibit, Lampi said. Orphaned moose calves also run into a housing shortage because not every zoo displays them and transportation costs are pricey from Alaska to the Lower 48, he said. Two orphaned moose calves came to the zoo in June. One is scheduled to stay as part of the collection and the other will go on to another zoo, Lampi said. Of all of the orphaned and injured animals that come through the zoo, about 20 percent end up staying. “If your exhibits are full with animals that are healthy, you just don’t have the room (to keep all of them),” he said. Take Tiska, the bald eagle, the oldest injured animal at the zoo. She was spotted on Huffman Road struggling to fly in 1973 and joined the zoo family soon after. Tiska has a poorly developed breast muscle that was most likely caused by living scrunched in a small cage, Lampi said. There’s also Mary Ellen, the three-legged lynx, who was hit by a car on the Seward Highway near the O’Malley Road exit in 1999. She suffered a fractured pelvis and nerve damage and had to have one of her legs partially amputated. Tiska, Mary Ellen and others are placed in living quarters to suit their disabilities, and they are still able to serve as “ambassadors for their species” to the public, Lampi said. Written by LisaAnn On March 3, 2011 In "lisa ann o'kane", "lisa ann okane"